Once Vietnamese had to fight against invaders coming from the North through the sea, the Gods called up the dragons to reemerge. They released jewels and jade from their mouths creating islands across the bay, forming a great wall of protection. 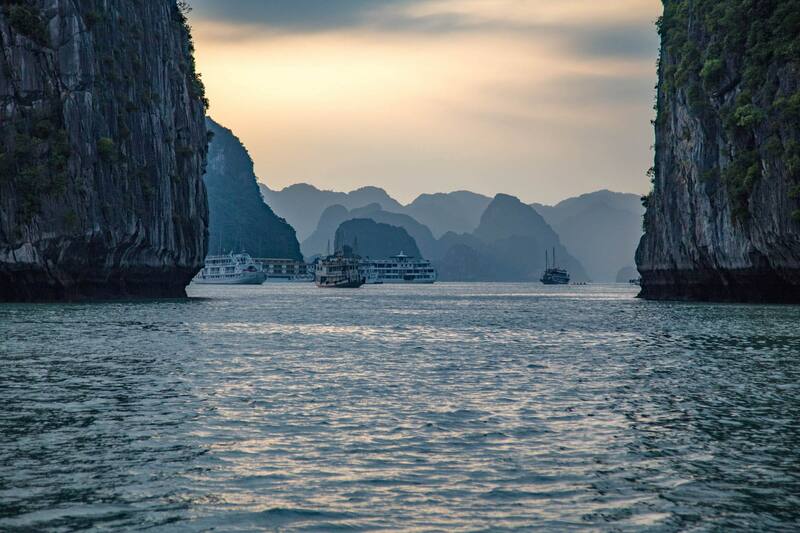 What they left behind became the region known as Halong Bay or “where the dragon descends to the sea”. Located in the Gulf of Tonkin, thousands of rocky and earthen islands, typically in the form of jagged limestone pillars jutting out from the sea, all of which blend together to produce an exotic and spectacular picturesque seascape. Designated a World Heritage site in 1994, quickly became the top tourist attraction in Vietnam. Before going to Halong Bay a lot of research was done to find the most suitable tour to our pockets, but above all, we just wanted to have a great experience in such a magical place. We checked a few travel blogs, Tripadvisor, where we read all kinds of stories, heard recommendations from friends who visited it and all of this helped us to avoid a bad tour. From hundreds of travel agencies, we picked Lily’s Travel Agency, where they presented us several tour options between $50 and $250. After one hour of studying the offers, we finally choose “Two days, with one night on a boat” $70 per person. With the backpack full of warm clothes we were ready to hit the road! Four hours on the bus and we arrived at the port where the captain of “Fantasea” was waiting for us with a group of 10 people from all around the world. After a really tasty lunch shared with a friendly German and Irish couple, we all get into a little boat and followed the tour guide, Nana, a funny Vietnamese girl visiting Dau Go Cave. The ceiling was decorated with stalactites like colorful chandeliers and the floor with plenty of rocks in diverse shapes of animals, flowers or whatever your imaginative mind sees it. To end our tour day we went kayaking. Paddling under a sea arch into a secluded lagoon where we spot monkeys playing wth each other. As we move farther away an extremely peaceful atmosphere combined with all the surrounding stroke us as we drift through the emerald waters of Ha Long Bay. We could see on the horizon the ships spread out across the sea, pushing through the haze and merging between the small islets. By the time we arrive back at the “Fantasea”, the sun was disappearing behind the islands and our shipmates were already back on deck ready for the multi-course dinner included on the tour. We ate again with the same friendly couple and in between of beers, Vietnamese typical food we shared personal stories of our travels. Time was passing by and we didn´t really realized it. The soft glowing light from the sky was already consumed by the night and the monumental landscape vanished into the darkness. On the second day, early in the morning, we went hiking on the Tip Top hill. Up there, the views were breathtaking, such an amazing scenery with all the limestone pillars and tiny islets rising from the sea. At midday, the boat went in the direction of Cat Ba, the largest island in the Bay with almost of its area covered by a National Park. Frequently used as an overnight hotel stop on tours to Ha Long Bay. We say goodbye to the people who book three nights and to our friends, the German and Irish couple. During our trip back to Hanoi, we had time to reflect on the two days spent in Halong Bay where we had several moments of yūgen. Beside of the weather being not so inviting to do sea activities and the grey overcoming all the landscape colors, nobody is able to be unmoved by the beauty and the greatness of Ha Long Bay. We spent a few days more in Hanoi, again involving ourselves in Hanoi’s daily routine meanwhile waiting for the next flight to Singapore.